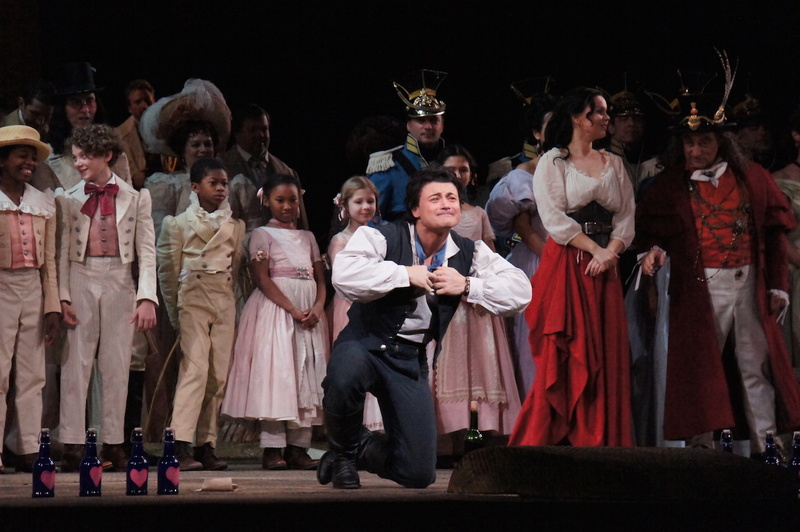 The bel canto pleasure of L’Elisir d’Amore is significantly enhanced by electric chemistry between its romantic leads. 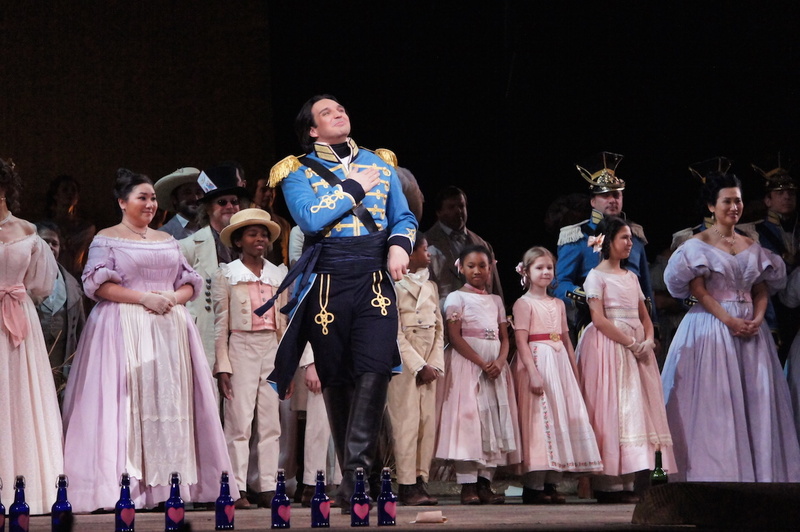 Having opened the Met’s 2012 season, this new production of L’Elisir d’Amore retains a fresh, airy feel. Although director Bartlett Sher and team usually work to freshen and find new angles on a classic work, their work here is ultra-traditional, almost conservative, and the result is visually gorgeous. At a time of all manner of directional concepts and conceits, the respect for the original text and intention is highly admirable. That said, Opera Australia’s outback Australia production of The Elixir of Love remains the cleverest version I have seen of this richly melodious, gently comedic opera. Sher and team’s seem to have deliberately gone back to grass roots, arranging the chorus in clear male/female groupings in lines so straight they evoke D’Oyly Carte. In work such as 2004’s The Light in The Piazza, Sher showed himself more than capable of creating a fascinating world of peopled by distinct characters for the chorus. To swing so far the other way seems a response to brief to be traditional, and thankfully the opera more than holds up to this approach. 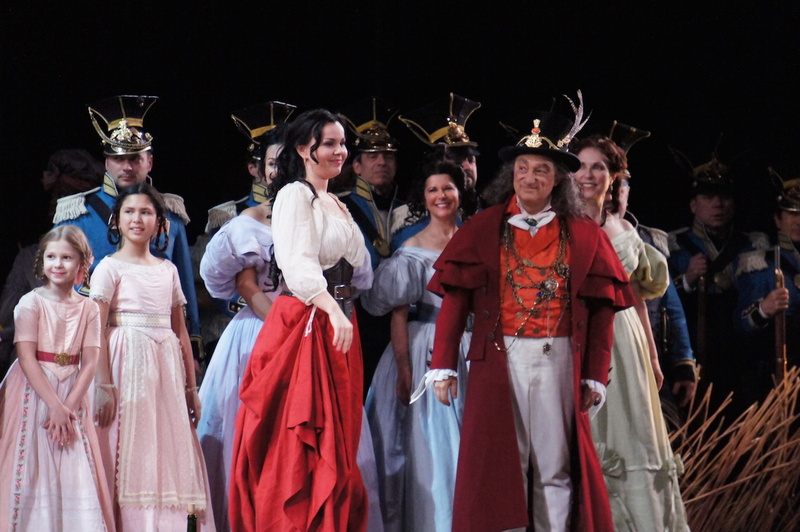 Catherine Zuber varies the palette for her lush costuming, beginning with earthy tones in the field before moving to light blues and greys in the town. The women’s gowns at the wedding are exquisitely hued in the palest of pale pastels. Soldiers of the visiting regiment sport uniforms of the most divine azure blue (which are wonderful to look at but surely completely impractical in battle). A charming top hat represents Adina’s slight tomboyish tendencies. Doctor Dulcamara must be doing a thriving trade in potions as he churns through a number of lavish, dandy outfits. 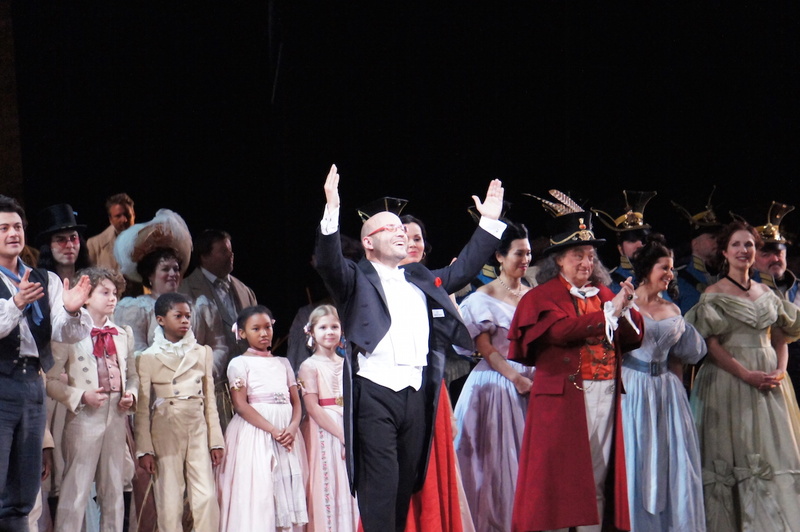 Maestro Enrique Mazzola, looking striking in red spectacle frames and matching pocket square, leads the Met Orchestra is a sprightly rendition of Donizetti’s highly hummable score. Placed high in the pit, Mazzola works closely with his singers to ensure a perfectly integrated performance. 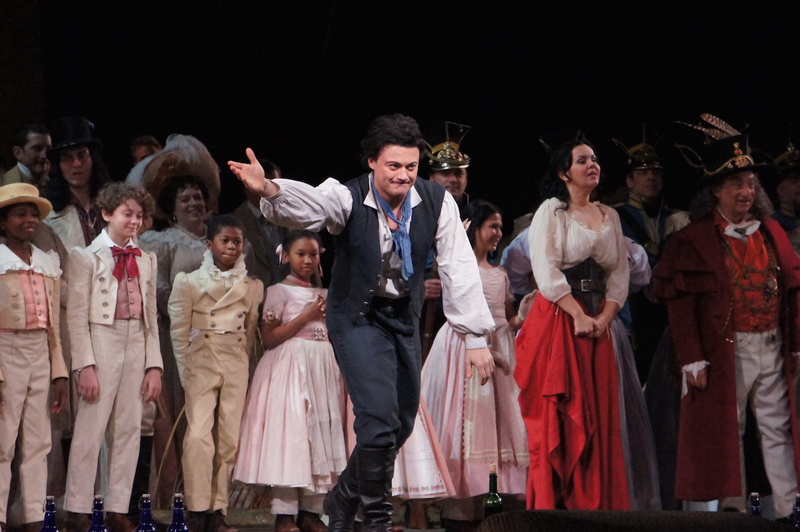 In a perfect match of singer and character, Vittorio Grigolo is exceptional as the lovelorn Nemorino. His rich tenor voice fills the cavernous Met with seemingly effortless power. Earning shouts of Bravo! from his first aria, “Quanto è bella, quanto è cara,” Grigolo is in excellent form, entirely convincing as a gullible, grinning youth. After drinking too much “elixir,” he appears with extra colour in his cheeks and is comically chased about by the fortune-hunting women of the town. For the sober “Una furtiva lagrima,” Grigolo brings down the house with an expertly controlled performance that allows moments of heartfelt pain to burst through the melancholy. 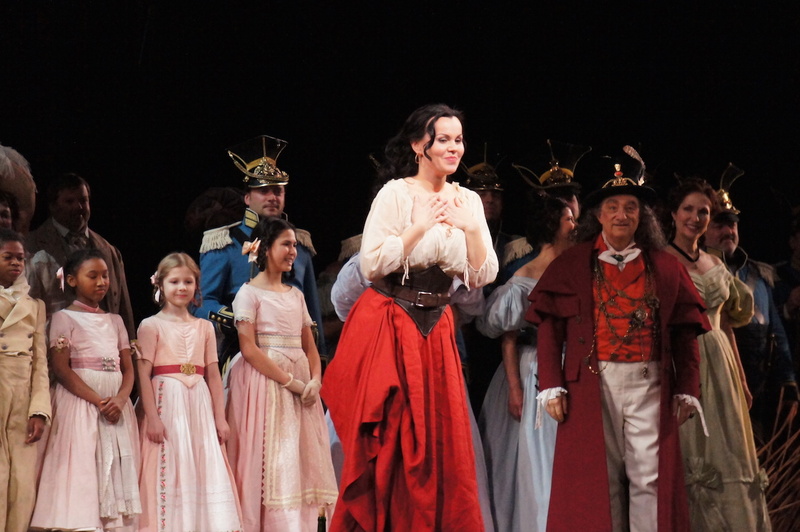 Blessed with a heart-shaped voice and a voice of gold, Aleksandra Kurzak is entirely delightful as Adina. A charismatic lead, Kurzak works equally well with each of her male counterparts and also clearly conveys the wealthy landowner’s respectful relationship with the workers and villagers. 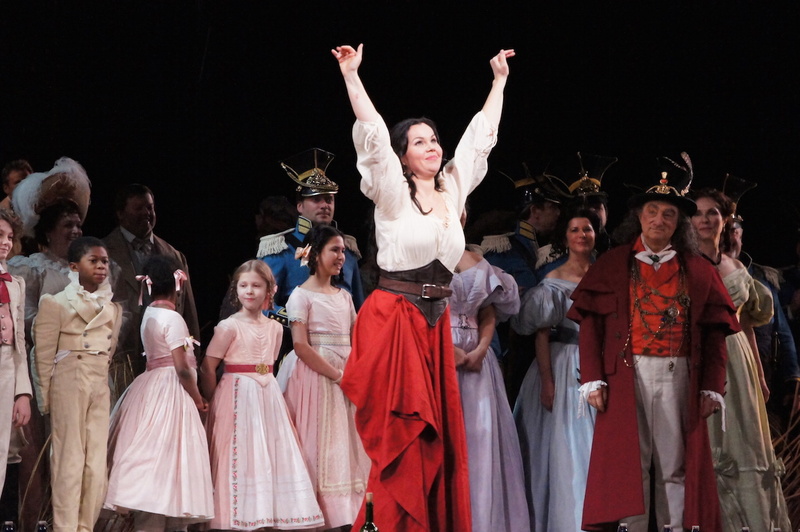 Kurzak sings the role with beautifully sunny tones, her expression coloured by the radiant joy of singing on stage. Kurzak and Grigolo enjoy palpable chemistry, with Sher’s focus ensuring the tension of the simmering love is clearly felt. When the pair finally has their first passionate kiss, the knees of Grigolo’s Nemorino buckle. 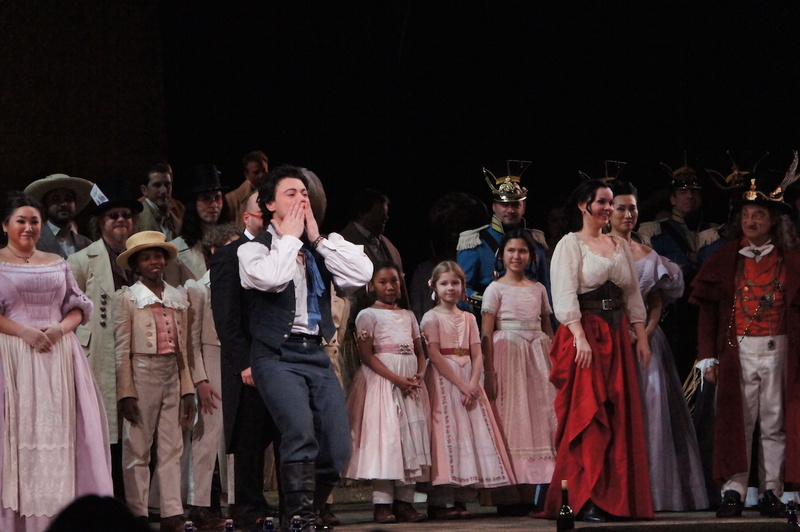 As the pair falls to the ground, Nemorino sits slumped against Adina’s bosom, delirious in his happiness. Adam Plachetka is a tall broad-shouldered Belcore, using his height to convey the character’s all-consuming confidence. Plachetka sings with commanding but unforced power. Highly experienced bass Alessandro Corbelli is a characterful Dulcamara. Singing with crisp diction, his rapid patter is expertly performed. Corbelli also enjoys string chemistry with Kurzak, and their act two barcarolle is wonderful. Young soprano Ying Fang provides strong support as the cheerfully friendly Gianetta, her voice ringing out clearly above the chorus. 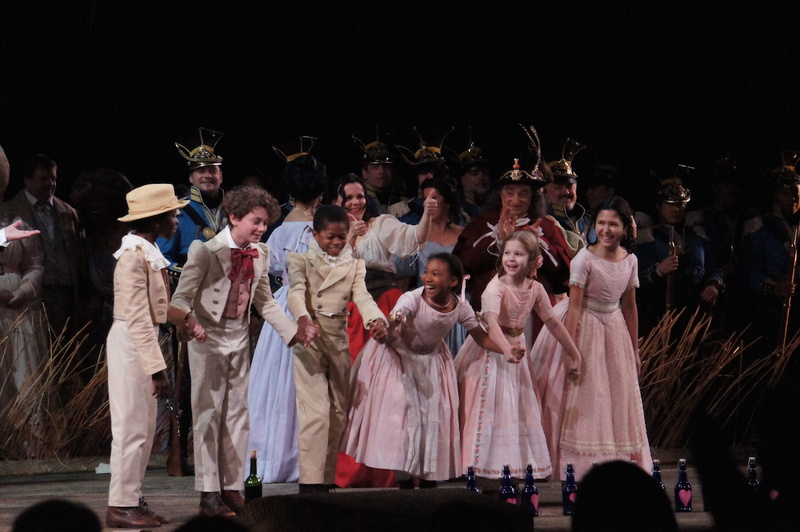 The current season of L’Elisir d’Amore is a joy, and is an ideal introduction to opera for newcomers. 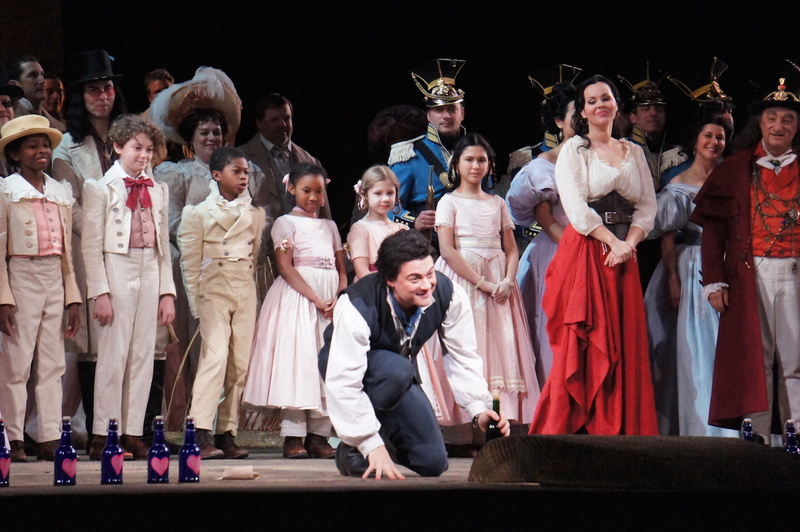 L’Elisir d’Amore was reviewed 8pm Saturday 26 March 2016 at Metropolitan Opera, NY. Man in Chair also reviewed the 2012 Live in HD presentation of L’Elisir d’Amore.